Mickey’s Very Merry Christmas Party is a special ticket event held on select nights in November and December. Because it is a special event, it does require the purchase of a separate ticket. Many question whether the extra ticket is worth the price.....my answer.... YES! While there are many reasons to attend the party, here are my favorite things about the party. 1. You can get in at early! The party begins at 7pm officially but ticket holders can get in at 4pm! This means that you can book a couple of fast passes before the party begins giving you more time in the park to play! People at Magical Kingdom without tickets to the party are required to leave by the start of the party. This usually means lower crowds during the party. Once the Party begins, you can see light up candy cane poles marking the party treat stations. You can get special treats, each different at each station, throughout the night! If you have allergies, don’t worry! Each station has apples, gluten free cookies, etc for those that need them. My family has dairy allergies, and while not all stations have dairy in the treats, the ones that did offered an alternative. A small part, or well a big part, of the Christmas season are all the yummy treats and Disney scores high here! I know this sounds like a very strange favorite thing but it's so true! I remember waiting for the special parade to start as I stood on Main Street. As the first float neared me where I stood, I began to smell some really fabulous smells. I soon realized that the float actually smelled good and emitted smell good air!!! For example, if the float was a gingerbread house, you would smell gingerbread! If the float was Clarabelle baking cookies, you smelled cookies! When the parade is over, and you are overwhelmed by all the delicious smells and need a fix, just go get a free treat! I come from a southern state but it does snow pretty every year. It usually happens in the dreary dates of January or February and not at Christmastime ...even though we all wish for a white Christmas every year. When in Florida, snow is the furthest thing from most everyone’s mind. As the parade is nearing the end, Old Saint Nick makes his appearance and ushers in the snow down Main Street as well! While it isn’t real snow, I mean it IS still Florida, the effect is absolutely incredible! The feeling is so magical! 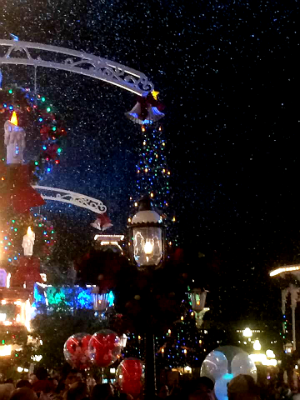 Snow swirling, Christmas music, scrumptious smell and Disney....need I say more! Disney World always offers character appearances and the party is no exception! The characters are out in their finest for the party! Party attendees have the chance to meet characters that they normally wouldn’t see, characters such as the seven dwarves or Jack Skellington. Characters will also appear at different dance parties throughout the park during the party. It so much fun dancing with characters!! 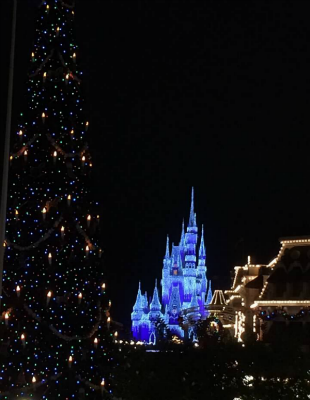 If you have never attended a Christmas party at Disney, put it on your bucket list! Christmas is my absolute favorite holiday by far and being at Disney just made it that much more magical! My family and I rode the rides, ate the treats, smelled the smells and danced in the snow all in one magical night!!! My youngest was five at the time. While, we had been to Disney before this was our first Christmas party and my youngest still talks about it! If you decide to go, let me help! It would be an honor to aid you in your magical journey!